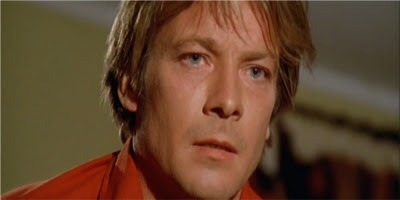 Robert Hoffman, is drawn into a tangled web of murder and madness in Umberto Lenzi’s bloodless giallo, which co-stars Suzy Kendall. After meeting the mysterious Barbara on the beach, Christian begins an affair with her. Back at her hotel room, he is attacked by a gunman and forced to kill the man in self-defense. The two decide to hide out at an isolated lighthouse, which is inhabited by a couple of odd characters that seem familiar to Christian. Meanwhile, the body at the hotel has disappeared, increasing Christian’s anxiety and causing him to question his own sanity. Although there are flashes of brilliance as the pieces of the puzzle finally come together, the journey there is tedious. The actual murders, carried out via strangling, are not shown until far later in the film, in a series of flashbacks which are devoid of any suspense. Numerous scenes of female mannequins and stuffed birds of prey add touches of creepiness to the overall sense of unease. Ennio Morricone’s incredible score is one of the film’s highlights, along with a stand out performance by Hoffman as the perpetually paranoid Christian. Ivan Rassimov makes a small appearance near the film’s end.